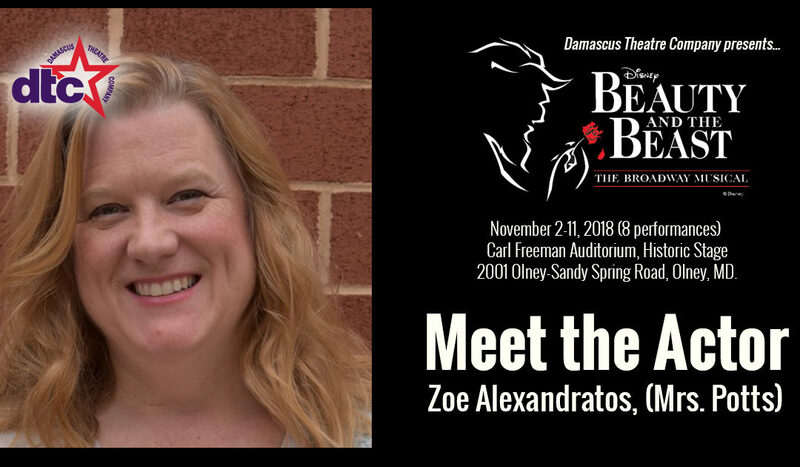 Damascus Theatre Company is lucky to have the wonderful Zoe Alexandratos playing one of Beauty and the Beast’s most beloved characters, the wise and nurturing Mrs. Potts. As you will see, Zoe has theatre in her genes, and has been recognized locally for her performance skills. Zoe and her British accent are just two more reasons to go see this show! 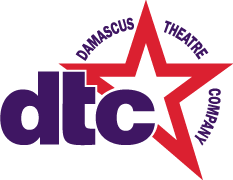 I first performed in the DC area as a clown with Children’s Theater of Arlington when I was five years old — my dad was the president of CTA at the time, and we did a pre-show performance about how to be an audience, where the bathrooms were, etc. As soon as I was old enough, I started acting in CTA plays. As a teen, I again performed with my dad in The Most Happy Fella with The Arlington Players, and as a young adult I played Reno Sweeney in Anything Goes and Mama Rose in Gypsy. More recently, I did some shows with the Fredericktowne Players and Rockville Musical Theater, such as Mona Stangley in The Best Little Whorehouse in Texas and the Mother in Spamalot, for which I got a WATCH nomination. Oh, and I’ve spent years as a featured performer with the Washington Revels, who do a gigantic winter show in Washington, DC every year. What is it about Mrs. Potts that makes you excited to play her? Do you see any of yourself in her? Mrs. Potts is just a real sweetie, kind of the mother of us all. I hope I can bring that warmth and love to the character. My castmates are so talented and fun! All the leads are so skilled vocally, so funny in their characterizations, and the kids in the show are a hoot! There is a real sense of camaraderie among the cast members that is infectious. My favorite number to watch is “Gaston”, because it is such an energetic, rollicking good time. My favorite song to sing is “Beauty and the Beast” because it is such a lovely song. Why would Mrs. Potts say that it is a great idea for people of all ages to come see Damascus Theatre Company’s Beauty and the Beast? Oh, pish tosh! I wouldn’t dream of letting any of you poor souls out there miss such a lovely story! It’s a tale as old as time, you know! Now, you mustn’t despair! There’s still time to make your reservations. Now off to the ticket booth with you… that’s right, off you pop!